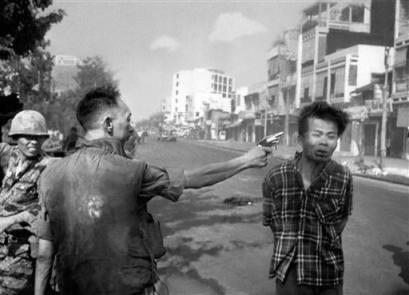 NEW YORK – Eddie Adams, a photojournalist whose half-century of arresting work was defined by a single frame — a Pulitzer Prize-winning Associated Press photo of a communist guerrilla being executed in a Saigon street during the Vietnam War — died Sunday. He was 71. Adams died at his Manhattan home from complications of amyotrophic lateral sclerosis, or Lou Gehrig’s disease, said his assistant, Jessica Stuart. Diagnosed last May, he quickly lost his speech but remained alert and worked into his final days. “Eddie Adams was an enormous talent and an inspiration to generations of AP photographers and staffers. His courage and creativity left a mark that will live forever,” said AP President and CEO Tom Curley. In addition to his photographs of 13 wars, Adams’ images of politics, fashion and show business appeared on countless magazine covers and in newspapers around the world. His portraits of presidents ranged from Richard Nixon to President Bush, and those of world figures included Pope John Paul II, Deng Xiaoping, Anwar Sadat, Fidel Castro and Mikhail Gorbachev. But fame — instant, enduring and discomforting — resulted from a single photo taken Feb. 1, 1968, the second day of the communists’ Tet Offensive, in the embattled streets of Cholon, Saigon’s Chinese quarter. Drawn by gunfire, Adams and an NBC film crew watched South Vietnamese soldiers bring a handcuffed Viet Cong captive to a street corner, where they assumed he would be interrogated. Instead, South Vietnam’s police chief, Lt. Col. Nguyen Ngoc Loan, strode up, wordlessly drew a pistol and shot the man in the head. Adams caught the instant of death in a photo that made front pages around the world. It would became one of the Vietnam’s War’s most indelible images, shocking the American public and used by critics to dispute official claims that the war was being won. In later years, Adams found himself so defined — and haunted — by the picture that he would not display it at his studio. He also felt it unfairly maligned Loan, who lived in Virginia after the war and died in 1998. “The guy was a hero,” Adams said, recalling Loan’s explanation that the man he executed was a Viet Cong captain, responsible for murdering the family of Loan’s closest aide a few hours earlier. Adams won a 1969 Pulitzer Prize for the Saigon execution picture, among the more than 500 honors he received in his career, including a 1978 Robert Capa Award and three George Polk Memorial Awards for war coverage. Born on June 12, 1933, in New Kensington, Pa., Adams served as a Marine Corps combat photographer in the Korean War and became one of the nation’s top photojournalists with newspapers, the AP from 1962-72 and again from 1976-80, and with Time-Life, Parade magazine and other publications. A crafter of images, Adams also cultivated his own — a prickly personality with a studied flamboyance that included a black wardrobe, a neck scarf and a wide-brimmed porkpie hat. Parade chairman Walter Anderson, a longtime friend, called Adams “eclectic, incomparable, cantankerous,” and skilled at “capturing tension” in his photos. Adams had no social or political agenda, but was at heart “a hard-news photographer, always sharply focused on the picture that tells the story,” said Hal Buell, AP’s former executive photo editor. “He was also a perfectionist who would go to the mat over anything he saw in the editing that he felt detracted from the story — but he was most critical of himself, for opportunities missed or not up to the high standards he set,” Buell said. Adams’ latest project included a video profile featured on Jerry Lewis’ annual 24-hour Labor Day Telethon to raise money for the Muscular Dystrophy Association — an event that Adams himself once regularly photographed. “I’m touched by the courage and strength he’s shown in facing ALS,” Lewis said. Although his photo from Saigon endured as his most powerful image, Adams was more proud of a photo of boat people fleeing postwar Vietnam that helped spur Congress and the Carter White House to admit 200,000 Vietnamese refugees to the United States. In 1988, he founded the Eddie Adams Workshop “Barnstorm,” an annual gathering at his farm near Jeffersonville, N.Y., where established professionals and promising newcomers could take part in photo shoots, lectures and instructional clinics. More than 100 teachers and 100 students attend the event each October. Stuart, the director of the workshop for several years, said its programs would continue. Adams is survived by his wife of 15 years, Alyssa, and a son, August; three children by a previous marriage, Susan Ann Sinclair and Edward Adams II, both of Atlanta, and Amy Marie Adams, of New Jersey; his 100-year-old mother, Adelaide Adams, and four sisters.